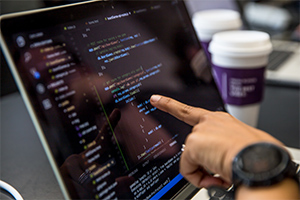 The web development, data analytics, cybersecurity, and fintech courses at Columbia Engineering Boot Camps blend informative lectures with individual and collaborative group exercises. Learners simulate a professional environment by working independently and in teams, in class, and at home. By diving into complex homework assignments and projects, participants get hands-on practice using their newly acquired skills. Through a dynamic learning experience and robust portfolio projects, you’ll get real insight into a “day in the life” of a full-stack web developer, data analyst, cybersecurity or fintech professional. To give participants a truly immersive learning experience, we provide an intimate class setting with a low instructor to learner ratio. In addition to our talented instructional team, learners have dedicated TAs in the classroom to provide wide-ranging support. I have learned more here than I ever could have learned on my own. 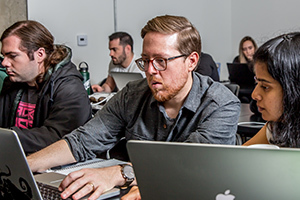 The way that the instructors care about your education is phenomenal … The experience has been one that I am happy to be a part of and completely recommend the Boot Camp for anyone who is interested in embarking on a new journey into Web Development. Learners do all of their coursework via laptop, eliminating the need for books or additional class materials. Our course structure is broken up into three main groups. Instructor-led discussions cover the history, usage, and background of a new technology or concept. You’ll put the material covered in class into action by working on timed in-class exercises and projects. 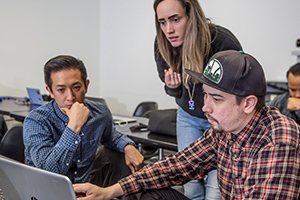 Class assignments focus on projects and applications that showcase your abilities across front-end and back-end technologies. Ready to learn more about Columbia Engineering Boot Camps? Contact an admissions advisor by filling out the form below.